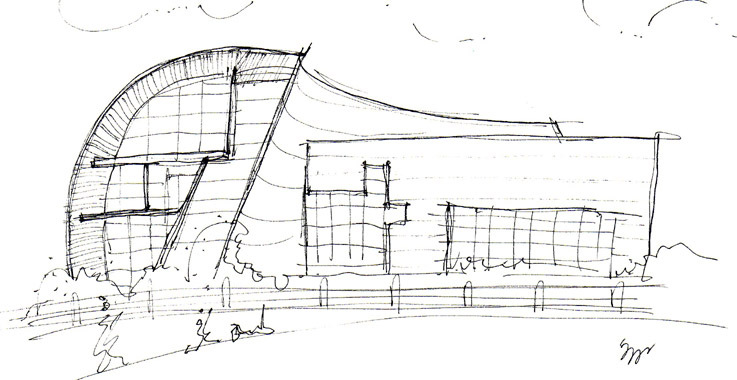 I did this sketch of the Museum of Contemporary Art in Helsinki in 2005. Designed by Steven Holl Architects, it is a study in the resolution of curves and angles. “The concept of Kiasma involves the building’s mass intertwining with the geometry of the city and landscape which are reflected in the shape of the building. An implicit cultural line curves to link the building to Finlandia Hall while it also engages a “natural line” connecting to the back landscape and Töölö Bay. In the landscape plan, extending the bay up to the building will provide an area for future civic development along this tapering body of water, which also serves as a reflecting pool for Finlandia Hall and new development along the south edge of the water. The horizontal light of northern latitudes is enhanced by a waterscape that would serve as an urban mirror, thereby linking the museum to Helsinki’s Töölö heart, which on a clear day, in Aalto’s word’s, “extends to Lapland.” The changes in elevation proposed with the water extension and it shallow depth would allow for parking decks and/or highway linkages which are presently part of various planning considerations” – Steven Holl Architects.